I design native apps for Android and iOS. Both Android and iOS have high contrast modes. With this in mind, can I use low-contrast colors (say, 3:1 instead of the 4.5:1 that WCAG Level AA requires), knowing that users with bad eyesight can turn on the high contrast mode? Insufficient contrast in your app makes content hard to read for everyone. Icons and text might blend with the background, for example. An online color contrast calculator can help you accurately analyze the color contrast in your app, to ensure that it meets optimal standards. Strive for a minimum contrast ratio of 4.5:1, although 7:1 is preferred because it meets more stringent accessibility standards. All text should be legible and meet accessibility standards. The Web Content Accessibility Guidelines (WCAG 2.0) level AA requires a 4.5.1 color contrast between text and background for normal text, and 3:1 to large text. The current version of the Web Content Accessibility Guidelines is version 2.1, where the relevant success criterion (1.4.3) has not changed since version 2.0. However, WCAG 2.1 introduced success criterion 1.4.11, which requires a contrast of at least 3:1 for "[v]isual information required to identify user interface components and states" and "[p]arts of graphics required to understand the content" (with certain specific exceptions). Even if you are/were not interested in meeting accessibility guidelines, it is worth considering the following: a developer who creates content or a user interface with insufficient contrast forces (potentially) tens of thousands of users to do part of the accessibility effort for him/her, whereas a developer who uses sufficient contrast relieves the users of that burden. Which developer will have more satisfied users? I think this is the single most important consideration. 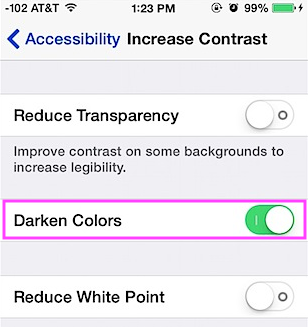 Will the colors you plan to use, still meet the WCAG after the darken colors or high contrast mode is turned on? Turning the High Contrast mode will most certainly drain the battery life of the device quicker, so would you still consider it a good user experience for users who will be using your app in this mode? Designing for users with a broad range of abilities can be super challenging. Smart designs use design elements like color, placement, and interaction in very intentional ways to help site visitors accomplish their goals — while giving the user the most enjoyable experience possible. You should aim for a design that lets your users reach the goal as easily as possible, so maybe not worry about the app aesthetics. But that is entirely a personal decision. If you design keeping accessibility in mind, it is also called as Universal Design. From my experience, I doubt if a product can be 100% universal, and it is upto you if you can afford to miss out on that small percentage of users who cannot use your products. can I use low-contrast colors...knowing that users with bad eyesight can turn on the high contrast mode? You can but you would not be WCAG AA compliant. Do these high contrast modes count as "assistive technology"? Yes, the contrast modes are considered assistive technology, which is really the answer to your first question. 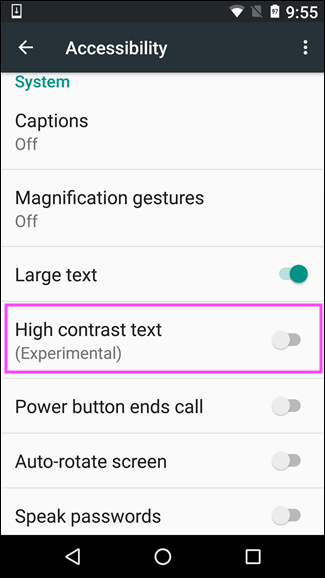 If you use lower contrast colors and the mobile device you're on does not have settings to improve the contrast, then the user is out of luck. Your app should be usable "out of the box" regardless of what settings are available on the device. Not the answer you're looking for? Browse other questions tagged accessibility color or ask your own question. Are there premixed Material Design color combinations I can use for prototyping?